Couldn’t make it to one of our in-house GPS classes? No worries! now you can join Touratech Adventure Expert and Touratech Rally Ride Coordinator, Eric Archambault for this in-depth, GPS skills class. – FULL TRANSCRIPT IS BELOW! All right, this is gonna be Navigating With Tracks Tips & Tricks. And this is based on a class we’ve been offering since 2016 at the Touratech USA showroom and at the Touratech Rallies. So we’re gonna break this into a video, it has a few parts. Kind of break it into little bit easier to digest segments and then at the end, we’re gonna have some GPS unit specific things that we’ll cover so you don’t have to watch four different GPS units when you only own one of them. And with this, we’re gonna start with what tracks are, we’re gonna kind of go through a little bit of terminology, how to dial in a track from the Backcountry Discovery Routes, or if you get an email from Touratech, you’re going to one of the rallies, how do you get it from your computer into your GPS unit. And then how to get it to show on your GPS unit so you can successfully navigate with it. And with that we’re gonna really focus on kind of the current and the older Garmin units. The Garmin Zumo 66G and 665, the Garmin Zumo 590 and 595, the Zumo 350, 395 and 396 as well as the BMW Nav 4, Nav 5 and Nav 6 units which are all based on various generations of Zumos we just mentioned. As well as the Garmin Montana 600 series. 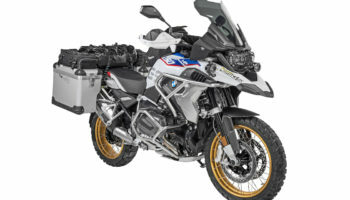 That would include the BMW Motorad Adventure Unit which is just a repackaged Garmin Montana. And we’re gonna touch base a little bit on the Garmin GPS Map 60 Series unit. It was a 60 and 62, 64, now the 66. And a lot of the other outdoor units, they’re touchscreen, they’re probably gonna follow the Garmin Montana format. The older push button style units with the smaller screens, those are probably going to follow the GPS Map 60 Series format. Some things might be slightly different, but Garmin doesn’t have too many different platforms, they package it differently for different applications. But those are gonna be there. If you’re using another unit that’s not a Garmin unit, be it a Trail Tech or a TomTom and even some of the cellphone apps, they can handle tracks. A lot of the things we’re going to discuss, especially in setting up your unit, your menus might be different but the functions and the topics we’re talking about do apply. So there might be some differences but the core principles are gonna be universal. So you can get a lot from this class, even if you’re not using a Garmin but we’re really focusing on the Garmins because in North America, Garmin just has the biggest footprint in the automotive, motorcycle and recreational space. So that’s what all of us here at Touratech USA run. We use Montanas, we kind of run all of them and most of us lean toward the Montana for various reasons but we’re really familiar with any of them. So if you watch this and you have questions later, definitely give us a call, we’ll get you pointed in the right direction or get you talking to the right guy that’s familiar with the unit you are using. And before we go too deep, I always like to start any class with introducing myself. My name is Eric Archambault, I’ve been with Touratech since 2012, I am the showroom manager at Touratech as well as the East Coast Rally coordinator so I spend a lot of time besides selling stuff and doing all the stuff you expect somebody at Touratech to do. I spend a lot of time riding both for Touratech and then for myself. I still am a huge enthusiast and love going out and doing the stuff. And then setting up the events, both the East Coast Rally and I normally help out a lot on the West Coast Rally doing all the pre running and for years I led rides. I do get to use a GPS in a lot of capacities. So I really think I’m a bit of an expert there, at least very, very familiar. Expert is a big phrase but I’m very comfortable using these units and have used them in a lot of different aspects. Where if you’re creating a ride or just doing something fun for yourself or you’re setting something up for hundreds of people. The things you do might be different but the fundamentals will be the same. And well, I started at Touratech in 2012 and that’s when really my GPS use, I started using it a lot and really grew there. I am rooted in using paper maps, I was in the United States Marine Corps and I did the land nav where you walk around the woods with a compass and a map and I did pretty well with that, I understand map reading and that type of backcountry navigation. And I’ve also done timekeeping in Duros where you have a roll chart and then you’re following, you’ve gotta keep a certain pace and hit things at certain times, and if you’re too early, you’re in trouble, if you’re too late you get penalized as well. I still do some of those events every year. I do some European style time regularity rallies where it’s the same sort of thing but on public roads and there’s generally a rolling rule, if you get a speeding ticket, you’re automatically disqualified. So if you make navigation errors, you can try to make it up by speeding but you’re probably gonna get zapped and get disqualified anyways. So I enjoy a lot of the older types of navigation. I enjoy doing that, [reconnering 00:05:12] and that type of stuff. But when it comes down to it these days, the GPS and navigating with tracks is a really fun way of navigating. It’s a lot easier and if its not in a competition format, well with a road book rally, you’re doing math in your head. You’re figuring average speeds and time and distance and you’re looking out for turns and you’re always kind of glued to your odometer. And navigating with a track, especially for something like a Backcountry Discovery Route, it’s a lot more fun because you’re just following a path, you don’t have to worry about, does this road go somewhere? You have something that’s no good and you’re just out there exploring and having fun. Somebody else did the legwork, and doing legwork’s fun too. But it’s great to go out there and just go chase a track that either you’ve written before or somebody told you, “Hey, this is awesome.” And you’re going and doing it, or something like the backcountry route where you have a great non-profit that’s out there producing these rides and keeping these riding areas open for you. So that’s just a little bit about me. I always like to start any GPS based class to talking about paper maps because it’s gone away a lot but years ago especially, the old timer that would always stand up and I used paper maps and a compass. And if my compass stopped working that means the core of the Earth isn’t spinning anymore and we’ve got bigger problems. And I still carry a compass with me and I still carry paper maps and it’s really not uncommon especially if I’m out there trying to create a ride, be it helping with the Backcountry Discovery Route folks or for one of the Touratech Rallies. And I’m out there and I am running my GPS, I can see where I am, but there’s no replacing that three foot piece of paper that is gonna show you that really big picture. So I bounce between them and especially when I’m finishing up and polishing up a rally, I normally have multiple paper maps on my desk, because they all show you something different. Be it a motorcycle focused map, or just a USGS map or maybe a regional map that’s just for recreational use. And you can get a lot of information from all those. And then your map reading skills, if you’re just getting into it and you haven’t really used paper maps and you start writing topographic maps on your GPS, and you start learning to read the contour lines and the symbols. And you grab a paper map and you’re gonna find a lot of it’s the same. So, they do go hand in hand. If I’m out there pre running for an event, I have the paper maps, I’m writing the GPS, I probably have a satellite transponder for in case of emergencies on me, and I do have my little write in the rain notebook that a lot of times, it’s just quicker to write down a quick note. I’ll drop a waypoint and say, “Hey, two miles after waypoint 005, really ruddy and muddy. Probably don’t run beginner riders down it, recheck before the event, just in case everything dries up.” So, all this technology works together, use all the tools you can get for the job and a GPS is a great tool and it’s made backcountry navigation a lot easier in the recent years. But don’t leave the paper maps at home, they still have a place and they still give you a big picture that’s hard to replicate on a four or five inch GPS screen. So, that’s just my piece on that, I just like to clear that up that a lot of times people have this mentality, even if they maybe have no experience but they hear people on both sides arguing, one’s better than the other, right? They both have their strengths and weaknesses and together they’re better than either of them alone. So there’s that. We’re gonna go into terms of vocabulary. When it comes to GPS and backcountry navigation, there is a lot of terms, especially when you get into the electronic side with the GPSs, that sound very similar that are completely different things. So, I always like to start with getting everyone on the same sheet of music, on when I say track or route or waypoint, what I mean and then you’re not trying to make your GPS do a thing that it can’t do because you’re using the wrong term. And not that I’m always right, but in this class I’m gonna make sure I’m using the correct terms. So, we’re gonna just dive in, it is only a couple of them and it’s gonna clear up a lot of clarification. It’s gonna get you kind of in the right mindset as well for when you’re dealing with a GPS and what it can do and what it actually is. First term is gonna be waypoint. And we’ve got three images here. The top center one. That one’s going to be a screenshot off of a Garmin Montana. You have a little campsite that’s marked 006. That was just the waypoint number that was given. The red line is a track that’s been shown on the map. You have a contour line up in the right hand corner, and then down below you have a little bit of a blue track that is just a active track that happened to be on the GPS unit that I grabbed this screenshot from. And the big thing with a waypoint, the bottom two pictures are gonna be from Garmin Basecamp which is gonna be your computer side software when you’re dealing with Garmin GPS units. You have the GPS itself and then you have your computer interface. It lets you manage and build a lot of stuff. And that’s gonna show you more details. And that bottom right hand one, it says position and it gives you a coordinate. It’s north 47 degrees, 19.132 minutes, west 118 degrees by 40.692 minutes. And the big thing that I’d like to bring up on this, that position is fixed on the globe. If you think of the globe as just a white ball, you have your latitude and longitude points. Some are up down, some are left right. Those positions don’t care about what map you’re using. It is just a position on that sphere that is the Earth. And you obviously want to have the best map, the most detailed map for your area. But those positions don’t care about the map. In the case of this waypoint, regardless to what map you have, that waypoint’s gonna be shown on top of it. So it’s not an address that well, if my map doesn’t show the streets, it’s not gonna show. It is showing the point on the Earth and it doesn’t care about the maps. You could have no maps, it’s always going to be shown as long as it’s not hidden. But by default, it’s gonna be shown, and you can see too, in the Garmin Basecamp views down there in the bottom, you can add notes and other information that you’d like. Or you can change the symbol, if it was a gas station, put a gas pump or something like that. But, big takeaway, a waypoint is just a fixed position on the globe. And waypoints have a lot of use besides marking a campsite. I use them a lot if I’m gonna go ride dirt bikes and I’m running the GPS on the bike. When I park my truck and unload the bike, I mark a waypoint there. And then I will have that fixed point that I can look at on the GPS and depending on my maps, I can navigate back to either by saying, “Just take me there,” or I can kind of zoom out and see where I am and see that and then just kind of follow trails until I find my way there. And the same thing if you’re out there in the woods and you have a mishap. Either you break your bike or you break yourself or if your buddy breaks themself or their bike and you have to leave either a bike in the woods or leave a person in the woods, you can mark a waypoint. Maybe you don’t have a satellite transponder but you’re gonna go and get cell coverage and you’re gonna get first responders and you can tell them, “Hey, my buddy has a broken leg, he can’t walk. He seems okay, he’s not in shock. He’s at this location.” You’re gonna read off that location and any first responder is gonna know what to do with that information. That format is universal, it doesn’t matter what GPS they have or anything like that. That format is universal. You could talk to somebody in another country, this is universal. So it’s really great that way where you can mark locations, I’ve even done it, I’ve been riding around the woods setting up a rally and I find this great camp spot and it’s just hidden out in the middle of nowhere. I’m seven ways from nowhere and I find it and I can mark the waypoint and go, “You know what? Next week,” and I’m gonna drive out here. I know it was hard to get out here, but I think I can find a way out and ride back out there the next week and camp out for the weekend and just have solitude for a couple of days. So waypoints are a great way of marking a location that you’re gonna wanna use again. Be it finding your truck, finding your camp, finding your buddy that’s broken that you’re getting help for. It’s really a great tool. So track is going to be the next one. And this is where we’re gonna get into that fuzzier terminology a little bit. And a track, up top we have a picture, another again, screenshot from a Garmin Montana. And the red line is a track. This is somewhere in central Pennsylvania where we do the East Cost Rally. I’m sure that was one of the rides we did one of the years and there’s waypoints and stuff laid over it. But that red line is a track. And down below is an example and it’s not of that track, so don’t geek out and say those position points aren’t in Pennsylvania, they’re not, they’re in Washington. But it was just a good example I had on hand. And it really highlights what a track is. And a track is a series of positions that are connected by a line. And again, the positions are sort of like a waypoint where you see the latitude and longitude coordinates but they’re not related to the map. They’re related to the world. They’re related to that sphere that we’re on. It’s just a path you either intend to go or somebody went before and then you intend to go. Or you have confidences there and you mapped it out using satellite imagery or other maps on the computer. So, the thing with the track, and the tough part is there’s a very small part of the world that even the people that navigate that use it, it’s used for backcountry travel, be it overlanding or backpacking, all that type of stuff. And especially for off road motorcycle use. I think maritime and some aviation, they still use it because if you’re on a boat or an airplane you’re not using routes either. And it’s a way to make paths that you can repeat and navigate with. And that’s why when you call Garmin, you sometimes can have a hard time even calling a lot the companies that make GPSs, because so few people use this that their tech support people, they’re used to, “Well, my car GPS doesn’t know where the mall is, why doesn’t it know where the mall is?” And it’s for whatever reason. This is kind of a specialized navigation and it’s great for what it is because it doesn’t care about your maps. And I could give it to you and you could have maps that are five years old, you could just have a different version of the map, it doesn’t matter. It’s gonna show you that same line. We’ve just taken a Sharpie and drawn it out on the map, hitting all these position points on the globe. So that’s why we use Backcountry Discovery Routes. Or use these for Backcountry Discovery Routes and for Touratech Rallies. Because everyone’s gonna be running a little bit different map sets. Some of them might be older. You might be running a Topo map, or maybe a third party map or something. And you’re gonna see the same thing. You’re gonna follow the same line. And it’s not gonna give me any prompts, you’re just overlaying this track on top of your map that you intend to follow, and as long as you stay on that line, it’s gonna go where that line’s supposed to go, where it was intended to go. And then getting a little bit more into tracks, the neat thing that the GPS units do, is you have your current track. And that is gonna be what we’re all used to seeing on the screen. You kind of get a pale blue line behind you and maybe if you cross over, you’ll see it again, but that’s where you’ve been. And a lot of times we call it a breadcrumb trail. It’s where you’ve been. And that’s gonna be your current track and this is a screen grab again, off of Garmin Montana. And when your current track is full, whether you have it set to reset every night at midnight or after a certain number of points, or after a certain file size, it’s gonna become an archived track. On some of the Garmin Zumo units, instead of having current track and archived track, you’re gonna have current track and there’s gonna be a bunch of saved ones. And the format’s gonna be similar to the ones below the archive track here, where it’s a date and a time. In this case, those are saved tracks in the case of this Garmin Montana, and those were just written before and then dragged back into the unit as a saved track. Normally there’d be a name. You’d name it something that’d make sense, like that bottom one, 02 Stone Valley Loop which was one of the Touratech Valley East rides a couple years ago, that it was given a name that would make sense. But your GPS, unless you disable the feature or turn it off, it’s always gonna be recording where you go. So when you plug it into your computer, if you go and you just wander off and you find this really rad road, you can go back and look at it in Garmin Basecamp and go, “I’m gonna save that section because you know, I think I’m gonna go back there sometime and ride that again,” or “I’m gonna show my buddy because I was out in the mountains and all of a sudden the dirt road turned into this beautiful five miles just paved go-kart track in the middle of the woods.” And you’d be surprised how many times that happens, too. And it’s really great when it happens and it’s really great when you can go, “You know what? I’m going back there next week and I’m just gonna rip that for 20 minutes.” So, that’s the rest of tracks is it’s also something that’s being saved behind you, that’d be your current track or an archived track and then if you bring them in, it’s gonna be the saved ones, because the GPS unit says, “Hey, you saved this and now you brought it in.” Not “We’re recording it,” or “We’re archiving it on the unit itself.” So that’s the different between those. The screen will vary a little bit on some of the Zumos, but it’s the same effect. Route and trip and then even sometimes adventure. Garmin likes to, especially on the Zumo units, update their terminology. They’re trying to keep it sounding a lot like a smartphone and a lot of it’s trying to make it more comfortable for people where people do complain if you’re using 20 year old terms. Those of us that have been using the GPS units, the [kind of 00:19:33] units for 20 years kind of hate that they changed. The same thing has a new name and it’s still the same thing, but it’s six on one, half a dozen on the other, I guess. So, a route or a trip or any of those things, that’s not a track. Pretty much if the unit’s trying to make it not a track, you just wanna say no, if you’re doing backcountry navigation. The GPS is going to take a handful of points along that track and show you how smart it is by using all of the usual auto routing features, be it avoiding tolls or highways. You want dirt roads, you don’t want dirt roads. You want twisty roads, and it’s gonna try to put as many of the things you want and as few of the things you don’t want along that path. And these are great if you’re just saying, “Hey, I’m in Seattle, I wanna get to Spokane, I wanna do it the fastest way possible,” boom, or you’re leaving Seattle and you wanna hit a store somewhere along the way and you’re going to Idaho Falls. It’ll figure it out and you really don’t care about the path as long as you hit a couple of points. But if you’re doing backcountry navigation, routes and trips and any of that stuff, it’s not gonna work well because it’s gonna want to snap you to roads, it’s gonna look at what your routing is and generally you’re gonna default your routing to get you somewhere the fastest. Because if you’re punching in an address, that’s what you want. So while these have a place, they don’t have a place in backcountry navigation, that’s really the focus on this, is doing Backcountry Discovery Routes, or going to the Touratech Rally and riding some rad rides. So I would just avoid all of this for that type of stuff. Just it exists and if you wanna go down that hole, explore it. But if you’re trying to do off road stuff or backcountry stuff, routes and trips and especially if you have a track that you know you wanna ride that path, if you make it a route or a trip, it’s almost guaranteed to make it something that you don’t want to the point that if you’re at the Touratech Rally, people will come back and they wanna go ride a ride. They’ll be right outside where we hold the event, “They’ll say take this,” they’ll convert to a trip and they’ll ride the highway around the forest and get back to right where they started because the GPS is like, “Why would you go down all these dirt roads? Because you started here, you finished here, you went that way. So we’ll take you that way and we’ll bring you back here.” And that’s what happens. So, if you have a track and you want to ride a track, you need to show the track and follow the track. And we’ll get into it a little bit more how to do that, but route and trip, he GPS, especially the Zumos will push you towards, but it’s not applicable for backcountry travel and just say no. So now we’re gonna get into one of things that is kind of the harder part and it’s one we get a lot of questions about is loading tracks into a GPS. And if you have a Garmin GPS, to load the track into it, you’re gonna need to have Garmin Basecamp on your computer. And that is a free download from Garmin and we have a screenshot of the software right here, of Garmin Basecamp. And this is where you can manage your different maps, you can save and archive data, and you see on the left hand side of the screen, that on my computer there is folders with events that I’ve done and different Backcountry Discovery Routes. And even last week and last month, the things have archived in there. So you can really save a lot of information and you can create tracks in here. It’s a really great piece of software. A lot of people complain it’s a little bit old, but the nice thing is you learn it and it’s not gonna change next week, or in six months if you haven’t used it because it’s winter and you’re not doing motorcycle things, you’re getting ready for new trips and you fire it up and it has an update and nothing’s where you left it. I appreciate that this software has not changed much in a long time. So the first thing we’re gonna do and I’m gonna assume, if you don’t have Garmin Basecamp and you’re going to try to go through this, just pause this video, go to Garmin, download Garmin Basecamp, get it unpacked, and then you can even follow right along with this. So we’re gonna start up with the desktop view. And I’ve already downloaded the California Backcountry Discovery Route. It’s the third from the top on the right hand side, it’s a GPX file. That’s the way this type of GPS information is saved, and for Garmins it’s kind of a universal format. And so I have that on my desktop. If you download it, sometimes it’ll go to your downloads folder, just know where you put it. And in some cases, some computers still will download it as a zip file, and if you’re gonna try to bring it into Basecamp, you need to make sure you unzip that file. And Basecamp won’t tell you that you need to unzip it, it’ll bring in the zip file that doesn’t work and then that’s frustrating. So if you download it and it’s in a zip file, unzip it before you try to bring it in. In this case, I just put it right to my desktop so it’d be easy for this example. And then we’ll go back into Basecamp here, and we’re gonna go to file, and before actually we even go to file, on my computer, on the right hand toolbar in the middle of there, or the left hand toolbar, rather. In the middle, you have my computer, and that’s everything that’s saved on there. And I have my collection selected, and that’s kind of the top where you can save things menu. That’s gonna be your broadest one. And if I was clicked in another one of those sub-menus and I imported something, it’d go there. Then you can see that when you go to file and import into, it says my collection. So if you forgot to do that, you’ll get that visual cue that, “Well, I don’t think I wanna put the California BDR into my Washington Backcountry Discovery Route because that wouldn’t make sense.” So just make sure you’re at my collection when you go to import. And a lot of times, even if I’m doing more generic stuff, I kind of like to go just to my collection and then I put it where I want it and maybe I’m just not super confident with computers sometimes, so I don’t mind the extra step just to know that it’s not gonna go into the ether or it’s gonna be lost. I’d rather go to my computer and then drag it if I need to drag it somewhere. But a lot of times if there’s a Backcountry Discovery Route or the Touratech Rally, you’re gonna want to have it in it’s own little page or folder anyways. So from there, you’re gonna go down, import into my collection. And here we’ve kind of scrolled down, we got into where we found where the file was on my desktop. And I am using a Mac here, on a PC, it’s very, very similar. I bounce between the two platforms and I can’t tell you the difference. So I know there are differences but it’s gonna be very similar. So we select the file and then we’re gonna hit import. And then from there you can see now in my collection, I have the California Backcountry Discovery Route and with the BDRs, it is nice that they date the files. So you know when you downloaded it, and if they do an update, they change the date. So if you have one, and I think I have some saved that are many, many years old. You want to navigate with the most current one. But it’s kind of a nice thing they’ve started doing where they put the date in there. And below the on my computer on the left hand side, you have where our California backcountry discovery route is highlighted. Down below, you see there’s a list of waypoints and things and we’ll zoom in a little bit here. And yeah, again, you’ll see all that and you can start to see that there’s fuel stops and then you can even see some of the tracks. So you can see that all of that is everything that’s in that tab on my computer, in your collection there, you can see all the contents of it, the waypoints and then the tracks as well. And then from here, you’re gonna want to import it into your GPS unit itself because having it on your computer is great, but your computer doesn’t have a GPS and you can’t ride with your computer on your handlebars very well anyways. So, actually we’ll back up back a sec here. And you can see that I have my Garmin plugged in. So, up at the very top is my Garmin devices. And you can see I have a Garmin Montana 600 hooked up. And then that no name is the micro SD card that’s in the unit itself. And when you go to import it, yeah, there’s also some maps but when you go to import it, it’ll give you the option to select if you wanna put it in the micro SD card or into the internal memory of the GPS. So we’ll go back to importing it in there. You have to be highlighted on the California BDR and you go to transfer and it’s gonna say “Send California BDR to Sandberg 2018 to device.” And it’s nice that they give you whenever you’re in these transfer modes, it’s not just saying, “Do you wanna send this file,” it’s giving you the file name. So you get that reminder and just make sure, “Yep, that’s what I wanna do,” and I’ve definitely caught myself where I clicked on something else or fat fingered it a little bit and go, “No, no, no,” back out and click the right thing. So you select that and it’s going to give you this thing here, it’s gonna ask you, “Okay, select which device,” and if I had multiple GPSs hooked up to my computer it would list all of them. When I go down. It gives me the two tabs, the Montana and no name. And these tracks for the Backcountry Discovery Routes where it’s just tracks and waypoints, they’re pretty small files. So you could put it in either one, if you don’t have an SD card, just put it in the internal drive. It’s down to personal preference, a lot of times I use the internal memory. But if you’re gonna do a trip and do a whole bunch of them, maybe you’d put them all in the card so you knew they were in the card. When you go to find them on the GPS unit, it looks at it all the same. It doesn’t differentiate between the card and the GPS unit’s internal memory. And below that too, select what you’d like to send. And tracks and waypoints, if you’re talking Touratech Rally or Backcountry Discovery Routes, that’s all you’re gonna have. If you were using routes and you wanted to transfer a route, you’d wanna click that and by default, I believe that is normally checked. I normally uncheck it and I just don’t use routes at all for anything. I always use tracks or waypoints. So select the applicable ones, the bottom two or something, the custom map and imagery, that’s something they’ve added recently. And again, it does a default click of never needing to do that and I just can’t really speak onto if that’s gonna cause problems. I’d say if you downloaded the Backcountry Discovery Route or the Touratech Rally or the KTM Rally, something like that, you just need to bring tracks and waypoints over so just have those selected. Then you hit send, it’ll give you a little spinny wheel for a second. And then, it’s not a bad idea to go into the unit itself where I put it in the unit’s internal memory. And then if you click on that in my devices, you can see below it says Montana 600, the unit number and you have this list of tracks and higher up there are the waypoints, so you can verify what you put in the unit’s actually there. And it’s a really good practice to do, rarely are there problems, but just out of loading hundreds of GPSs at the Touratech Rally, when people bring them and I need to load them, I normally need to check that before somebody goes to go out for a ride and then they’re in a rush or if you’re gonna get on an airplane and go somewhere, and you just loaded it real quick, I’d even fire up the GPS and look and make sure that the tracks are there. So rarely are there problems, but it’s just good practice, especially if you can’t fix it in a couple of minutes to double check. So, after I import something, I normally like to just look, I normally just do it here in Garmin Basecamp and check that it’s there. So, now you have the tracks loaded in your GPS, the next video we’re gonna cover how to actually dial in your unit for it and then we’ll have videos specific for all the common GPSs on how to show them on your GPS itself. So that’s the first of a few videos here on Navigating With Tracks Tips & Tricks. So we’re all talking the same language with the terminology, we’ve got the tracks from the internet into your computer, into your GPS. And then the next one, we’re gonna start dialing in how to display the tracks most effectively on your GPS and then we will have the unit specific ones on actually how to show it and change color and things like that on your unit as well. So hopefully this was good, hope you stay tuned for the rest of them. Of course if you ever have any questions, give us a call at Touratech USA, or shoot us an email. All of us play with this stuff, we all ride and go out and make tracks and follow tracks and get out there and do this stuff. So we’ll see you soon.